I’m not sure where I got the inspiration for this move but, I’ve gotta admit…I freakin’ love it. Specifically, through using this movement I’ve seen enormous carryover to the shirted (i.e. geared) Bench Press, but I’ve also noticed it functions incredibly well as a simple tool for teaching trainees (geared or raw) how to properly flex their lats. Considering the lats are one of the largest and most powerful muscle groups in the entire body, understanding how to fire them is of extraordinary benefit for overall strength, health, and function. Additionally, the “reactive” nature of this movement makes it a fantastic anti-extension core exercise, and provides a great opportunity to practice correct breathing patterns while simultaneously working to reduce excessive anterior pelvic tilt. I hope you enjoy the video and, as always, if you have any questions, comments, or suggestions, leave them below. P.S. 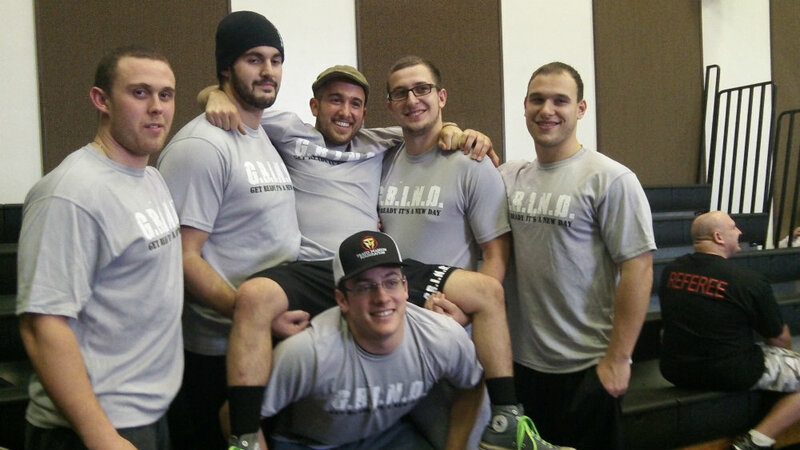 here is a picture of the UDel Powerlifting Team following the 1st day of competition this past weekend. Thanks to G.R.I.N.D. 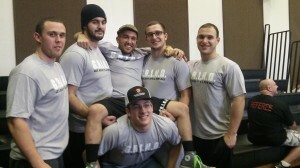 Sports (http://grind-sports.com/) for the awesome gear!!! As I said above, later this week I’ll provide a detailed report (with pics and videos) outlining all of our lifts and progress over the past semester.